As a flute instrumental of the Japanese Sailor Moon theme plays in the background and onscreen introductory text appears and tells the viewer that the five girls are about to enjoy a Summer holiday but before they can, four handsome men return from a battle long ago. The Dark Kingdom has once again revived! Sailor Moon, Mercury, Mars, Jupiter and Venus walk onto the stage. Suddenly a surge of energy sweeps across the stage causing all of the Sailor Soldiers to kneel over in pain. Sailor Mars asks what this evil energy is but before she can get an answer and evil laugh is heard. It's Queen Beryl and her four generals! Sailor Moon screams out in disbelief. How can this be happening? Queen Beryl explains that they have been revived through the power of people's hatred. Sailor Moon cries that if this is a dream, she wants it to stop. The next day Luna is running frantically around searching for Artemis who is enjoying a morning nap. He wakes up and asks her what's wrong and she tells him that Usagi had had a nightmare where the Dark Kingdom were reborn. Artemis says that they must tell everyone as Usagi's dreams almost always come true. They race off to find the others. The girls meanwhile are shopping for bathing suits in a shopping centre. Rei and Minako are having a good time trying on the different options and quickly encourage Makoto and Ami to join in. Usagi however is sleeping walking all over the place. It's not until the other yell at her to snap out of it does she come to and tell them all about the dream she had. They tell her that it was just a dream because they beat Beryl nice and proper the first time. Suddenly, Miss Haruna, their school teacher (with the exception of Rei who goes to a different school) enters and invites them all on a trip overseas! Rei senses something wrong however and tells everyone that Miss Haruna is really a Youma in disguise! Miss Haruna starts to cry but Rei isn't fooled and uses Evil Spirit Disperse which causes the Youma to reveal it's true form, Manneguin! Manneguin summons an army of Youma which surrounds the girls. Rei, Minako, Ami and Makoto try to transform but every time they mutter their phrases they are stopped by a kind of mind control power used by Manneguin! Just when all seems lost, Tuxedo Mask appears and begins to sing. As he sings he manages to somehow control the enemy, causing them to dance. Usagi looks on longingly. 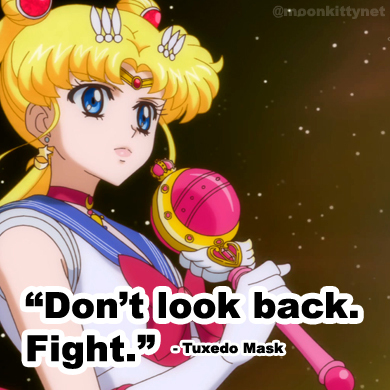 Once the enemy has been defeated, Tuxedo Mask disapears. Usagi begins to fantasise about Tuxedo Mask but is snapped out of it by Artemis and Luna who tell her to stop thinking childish thoughts about Tuxedo Mask and to remember the past when he was Endymion. Luna and Artemis reminice about the Silver Millenium when Endymion and Serenity were in love with each other and the four generals of the Dark Kingdom served under Endymion and were in love with Serenity's friends and guardians. It's the past and Princess Serenity and Prince Endymion are dancing and singing together. As they enter the waltz we see that Sailor Mars, Mercury, Venus and Jupiter are dancing with Jaedite, Malakite, Zoicite and Nephrite. Suddenly Luna and Artemis run on stage and tell everyone that while they were here, Queen Beryl had taken control of the people of Earth and taken over the entire planet! They all move to save Earth but are attacked rather fiercly by the four generals who Luna says are already under Queen Beryl's control. Above them, an image of Queen Beryl appears and announces that nothing will stop her now. One of the Sailor Soldiers screams out that she doesn't want to remember this awful past. Back in the present, Artemis and Luna seem to have lost Usagi again. They take a break from searching and decide to discuss Usagi and how they wish she could remember more about the past. As far as they figure, Usagi remembers Endymion but not exactly how Beryl took over the Earth and destroyed the Moon. Usagi eventually meets up with the other girls who are discussing what happened at the departement store. Suddenly Minako sees someone (who readers of the Codename Sailor V manga will recognise) she remembers from her old school, Seito, her first crush! The girls convince her to confess her love to him and she does so in song. Turns out Seito digs Minako as well and they both head out on their first date to an amusement park. Usagi and the other girls decide to follow. After arriving at the amusement park it doesn't take long at all for Minako to realise they've been followed and calls her friends out of hiding. Seito gets and idea and introduces Rei, Makoto and Ami to his three best friends, Students A, B and C. They sing and dance retro style. Usagi is left single while her friends all run away to an astrology fortune telling booth. Mamoru appears and tries to cheer Usagi up by offering to take her to the beach. She thinks he's just teasing her and runs away. Funnily enough, he was seriously going to take her! Elsewhere in the amusement park, Artemis and Luna are still looking for everyone. Artemis says that they should get serious about their mission but Luna says that she can understand where the girls are coming from. Artemis accusses Luna of being a typical women. Luna replies with a very suprising song for a Japanese production about how men and women aren't that different and that they should in fact be treated equally. Artemis appologises and they both continue their search. At the astrology fortune telling booth, Rei, Ami, Minako and Mokoto with their new boyfriends are getting their fortune told by a cloaked woman. Suddenly the woman begins to ask them what they would do if they knew someone who had a grudge against them and wanted to kill them. The girls realise something is wrong but it's too late! The fortune teller reveals herself to be Queen Beryl who tells them that her four generals had been reincarnated into these four men's bodies. The girls try to transform but Beryl's magic is too strong. Beryl demands to know where the Silver Crystal is and prepares to fire a blast at Usagi. Out of nowhere, Luna and Artemis leap in front of Usagi, saving her but getting blasted in the process. They collapse on the ground, seriously injured. Tuxedo Mask appears above them and begins to fight the generals and Beryl, but Beryl summons the Manneguin Youmas and he is easily defeated. Beryl tells the Youmas to take Tuxedo Mask with them and explains to the girls that if they want to see him again they should bring the Silver Crystal to the newely revived Dark Kingdom Castle. With that, they disapear. The girls, Artemis and Luna and Usagi all stand up, determined to defeat Queen Beryl. In the Dark Kingdom Castle, the four generals are beating Tuxedo Mask who hangs on a giant cross. Queen Beryl tells them that they need him alive as right now he is bait to lure the Sailor Soldiers here and after they defeat them she will force him to be her husband! Suddenly the girls arrive and transform into their Sailor Soldier forms. The fighting starts almost immediately with each of the Sailor Soldiers taking on a general and Sailor Moon fighting Beryl. Sailor Moon manages to knock Beryl out for a bit which gives her a chance to free Tuxedo Mask. While she's helping Tuxedo Mask however each of her friend's meets their demise while fighting for the fate of the Earth. Sailor Mars who had almost defeated Jaedite with Burning Mandala is attacked by him and blasted through the ice. Sailor Jupiter throws a Sparkling Wide Pressure attack at Nephlite but he manages to stagger towards her and with the weight of them both the floor beneath them breaks sending both of them to their deaths. Meanwhile, Sailor Mercury attacks Zoicite with Shine Aqua Illussion which does a bit of damage but in the end he defeats her by killing them both. Sailor Venus, the final Soldier left is facing off against Kuntzite. She blasts him with Love Me Chain which knocks him down. Suprisingly he starts to mutter Minako's name as if Seito has been reawakened in him. Sailor Venus goes to help him but she's too late as Kuntzite has once again gained control of his body and attacks Venus. Seeing no other choice, she raises her hand up high and summons a powerful Love Me Chain attack which completely destroys them both. Sailor Moon cries out for her friends but it's too late. Tuxedo Mask stands up next to her for support. Nearby, Queen Beryl has recovered and stagers on stage. She sees Sailor Moon, raises her septre and fires a blast of energy at her. Unfortunately, Tuxedo Mask leaps in front of it and is caught in the blast. As he lays on the ground dying, he tells Sailor Moon that he's sorry he couldn't keep his promise to take her to the ocean. Queen Beryl, while initiall shocked over killing Tuxedo Mask notices how the sun is now completely black and soon she will have conquered the entire world! Back in Tokyo, Luna and Artemis are alone in the darkness and worried over the fate of the Sailor Soldiers. Artemis tells Luna that he's sure they will wine because Sailor Moon could always use the power of the Silver Crystal to defeat Beryl. Luna panics and tells him that she can't because if she does, the crystal will take her own life! Back at the Dark Kingdom Castle, Queen Beryl decides to destroy Sailor Moon once and for all. She fires several blasts at Sailor Moon make direct contact with her, throwing her onto the ground. Sailor Moon, making up her mind to defeat Queen Beryl tells her that she will beat her with the power of the Silver Crystal! Sailor Moon raises the Moon Septre and begins to say the Moon Princess Halation attack but Beryl, not wanting to be sealed away again attacks her with one blast after another. From somewhere else, Sailor Moon here's her friends' voices. "Mars Star Power!" "Mercury Star Power!" Jupiter Star Power!" "Venus Star Power!" With the deceased Sailor Soldiers' souls offering as much power as they can, Sailor Moon manages to finally, destroy Beryl once more though not before the evil Queen can promise that as long as their's evil in people's hearts, she will always find a way to reincarnate through that power! As the last of her energy fades away, Sailor Moon crawls to the top of the castle's stairs and wishes to herself how she just wants everyone to be happy and be like they were before. Darkness falls. In Tokyo, Luna and Artemis have noticed that the Sun has returned to normal but they havn't heard anything from the Sailor Soldiers! Luna says that she's going to D Point to search for them. Artemis runs after her. After hours of searching for their friends they almost give up. Suddenly, Luna notices something and yells at Artemis to look at the moon in the sky and all the other stars! The power of love has beaten evil once again! The Silver Crystal reincarnated everyone once more! Sailor Moon, Sailor Venus, Sailor Mercury, Sailor Jupiter and Sailor Mars decend from the sky and run to their friends. Together they all sing and dance. During the celebration, Luna and Artemis reveal that Tuxedo Mask was also reincarnated! He and Sailor Moon embrace. As La Soldier ends, the curtain falls and the first Sailor Moon musical comes to an end. Or does it? After a round of applause the curtain raises once more to reveal Miss Haruna and the backup Youma dancers dancing and bowing to a reprise of the show's first song. As they leave the stage, the four generals walk on a quickly beat each other up then become friends as Luna and Artemis walk on and bow, introducing Queen Beryl and then Tuxedo Mask. Next up is Sailor Venus, followed by Sailor Jupiter, Sailor Mars, Sailor Mercury, finishing off with Sailor Moon. The entire cast joins in as together, villians and heros sing and dance to what will become the symbol of the Sailor Moon musicals, La Soldier. Everyone bows one last time and the curtain lowers and the first Sailor Moon musical comes to an end.